Nitric acid HNO3 gives H+(aq) and NO3-(aq) ions. 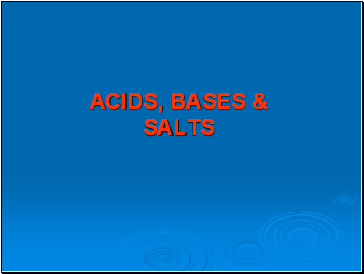 BASES are oxides and hydroxides of metals that react and neutralise acids to form salts and water only. 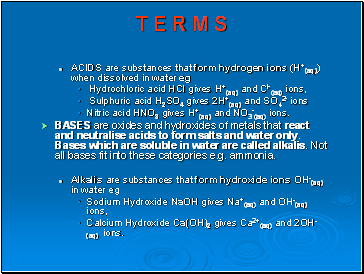 Bases which are soluble in water are called alkalis. Not all bases fit into these categories e.g. ammonia. Calcium Hydroxide Ca(OH)2 gives Ca2+(aq) and 2OH-(aq) ions. 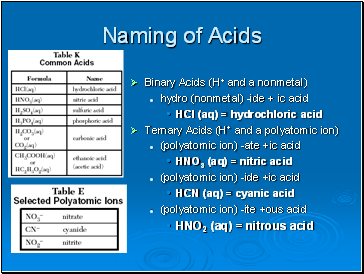 In acid solutions there are more H+ ions than OH- ions. 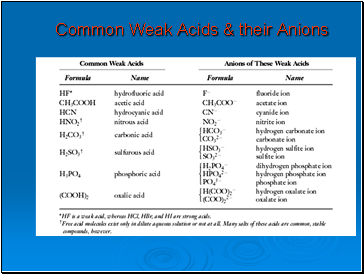 In alkaline solution there are more OH- ions than H+ ions. 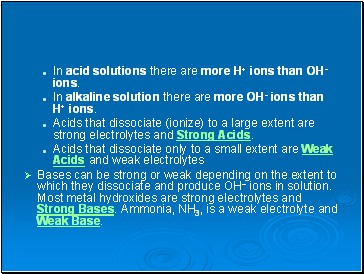 Acids that dissociate (ionize) to a large extent are strong electrolytes and Strong Acids. 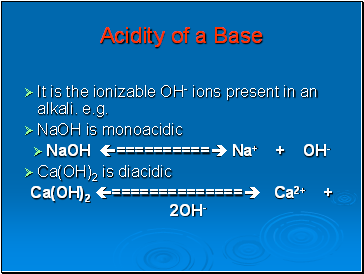 Bases can be strong or weak depending on the extent to which they dissociate and produce OH– ions in solution. Most metal hydroxides are strong electrolytes and Strong Bases. 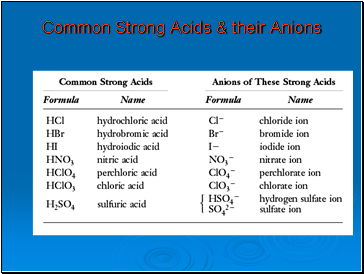 Ammonia, NH3, is a weak electrolyte and Weak Base. It is the number of ionizable H+ ions present in an acid e.g. 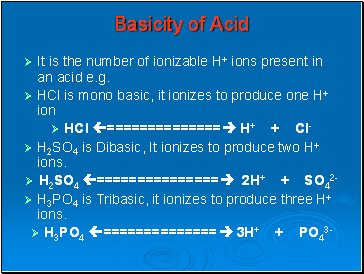 H2SO4 is Dibasic, It ionizes to produce two H+ ions. H3PO4 is Tribasic, it ionizes to produce three H+ ions. It is the ionizable OH- ions present in an alkali. e.g. Formation of Hydronium ion( H30+).